Want to enjoy the operation, lights and sound effects of exciting new DCC-equipped locomotives? Want to avoid the hassle and expense of installing decoders in your older DC engines to keep them operational? 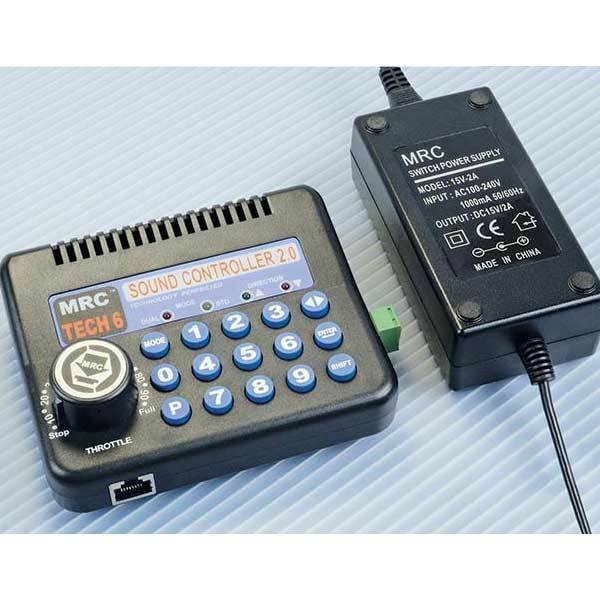 Then the MRC Tech 6 Soundcontroller 2.0 is the power pack for you. Simply use it in place of your old DC power pack and, at the press of a single button, you can switch between regular DC and DCC operation. Plug in the optional handheld walkaround controller (sold below), and two people can control up to 6 trains independently. Includes 2.0 amp regulated power supply (handles up to five HO locomotives running simultaneously), plus programming ability to set DCC decoder configurations* and DC momentum (if desired). Incredibly easy-to-use; for scales Z through O. *Note: This system will operate Tsunami decoders, except it cannot reprogram Tsunami decoder addresses. Use a friend's DCC system to change a Tsunami decoder's address.